There are a few staple dishes that I will consistently order in a restaurant, largely because there is something comforting about the familiarity of flavour. Fettuccine alfredo is one of those staples. Ever since I was a kid, I was always drawn to its creamy, rich flavour. My consistently ordering it, however, has also exposed me to the diverse range of fettuccine alfredos (or dishes masquerading as such) and how wrong it really can go. Marcella Hazan’s Classic Italian Cook Book has yet to lead us astray, so we decided to put ourselves in her capable hands to tackle this classic Italian favourite. In a large saucepan that can later accomodate all the cooked fettuccine comfortably, put in 2/3 of the cream and all the butter and simmer over medium heat for less than a minute, until the butter and cream have thickened. Turn off heat. Bring salted water to a boil and drop in fettuccine (cook pasta even firmer than usual, as they will be cooked some more in the pan). Drain immediately and thoroughly, and transfer to the pan with butter and cream. Turn on the heat to low and toss the fettuccine, coating with the sauce. Add rest of the cream, grated cheese, 1/4 tsp salt, pepper and nutmeg. Toss briefly until cream has thickened and the pasta is well coated. Taste and correct for seasoning. 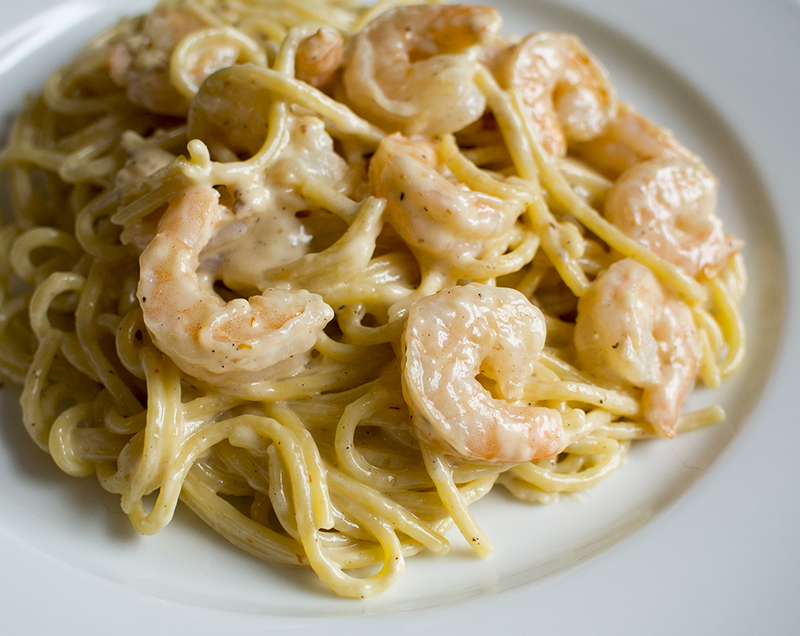 A few notes on preparation: The great thing about fettuccine alfredo, is it can be made heartier with a variety of different of meats, including breaded, pan-fried chicken breast or pan-fried shrimp. The dish was worlds better than the store-bought sauce and several of the Italian joints David had frequented of late. It was amazing how simple the recipe was, and yet it yielded such delicious dividends. Perhaps one of the highlights to be found in this particular cookbook is that you can do amazing things with just a few simple ingredients. Remarkably straightforward and quick to make, and it was so creamy and flavourful. I’d never noticed the flavour before, but the nutmeg really adds a delightful sweetness to the sauce. Definitely a dish to be tucked away in our repertoire!